Jesse Louis Lasky (September 13, 1880 – January 13, 1958) was an American pioneer motion picture producer. He was a key founder of Paramount Pictures with Adolph Zukor, and father of screenwriter Jesse L. Lasky, Jr.
Born in San Francisco, California, he worked at a variety of jobs but began his entertainment career as a vaudeville performer that led to the motion picture business. In 1911 Lasky was the producer of two Broadway musicals, Hello, Paris and A La Broadway. Presumably this is how Cecil B. DeMille knew him before they both ventured into motion pictures in 1913. 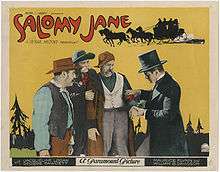 Lasky's sister, Blanche, married Samuel Goldwyn and in 1913 Lasky and Goldwyn teamed with Cecil B. DeMille and Oscar Apfel to form the Jesse L. Lasky Feature Play Company. With limited funds, they rented a barn near Los Angeles where they made Hollywood's first feature film, DeMille's The Squaw Man. Known today as the Lasky-DeMille Barn, it is home to the Hollywood Heritage Museum. In 1916, their company merged with Adolph Zukor's Famous Players Film Company to create the Famous Players-Lasky Corporation. In 1920, Famous Players-Lasky built a large studio facility in Astoria, New York, now known as the Kaufman Astoria Studios. In 1927, Lasky was one of the thirty-six people who founded the Academy of Motion Picture Arts and Sciences. Financial problems arose within the industry as a result of the Great Depression and the Famous Players-Lasky Company went into receivership in 1933. Lasky then partnered with Mary Pickford to produce films but within a few years she dissolved their business relationship. Lasky then found work as a producer at one of the big studios until 1945 when he formed his own production company. He made his last film in 1951 and in 1957 published his autobiography, I Blow My Own Horn. Jesse L. Lasky died at age 77 from a heart attack in Beverly Hills. He is interred in Hollywood Forever Cemetery, adjacent to Paramount Studios, in Hollywood. For his contribution to the motion picture industry, Lasky has a star on the Hollywood Walk of Fame at 6433 Hollywood Boulevard. Lasky Drive in Beverly Hills was named in his honor. 1 2 "Jesse Lasky dies.". Time (magazine). January 27, 1958. Retrieved 2008-06-08. Jesse Louis Lasky, 77. pioneer moviemaker who cranked out (in 1914) Hollywood's first feature-length film (The Squaw Man) in a barn studio; of a heart attack; in Beverly Hills. 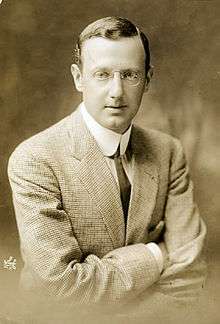 After his first movie venture (with a brother-in-law, Glove Salesman Samuel Goldfish, (now Goldwyn) and young playwright Cecil B. DeMille), Lasky joined (in 1916) with Adolph Zukor to form the Famous Players-Lasky Corp., which evolved into Paramount Pictures. ↑ "J.L. Lasky Invokes New Bankruptcy Law. Listing $2,020,024 Liabilities and $134,718 Assets, He Asks Deal With Creditors.". New York Times. August 3, 1933. Retrieved 2009-03-02. Listing a total of $2,020,024.24 in liabilities and assets of only $134,718.93, Jesse L. Lasky, pioneer motion-picture producer, today sought aid of the newly amended bankruptcy act to make a compromise with his creditors, and filed a debtor's petition with the United States District Court. ↑ "Jesse L. Lasky, Film Pioneer, Dies at 77. Early Producer Who Helped Build Movie Industry Suffers Fatal Heart Seizure.". New York Times. January 14, 1958. Retrieved 2009-03-02. Wikimedia Commons has media related to Jesse L. Lasky.